Fitzroy Gardens is my favourite Gardens in Melbourne. 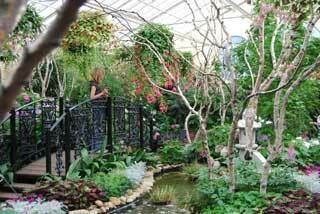 It also contains one of Melbournes' favourite tourist attractions - the Conservatory. ........It's lovely - my daughter is always asking to go back. It's of a Spanish Mission architectural style constructed in 1930. There are beautiful flower displays. These get changed five times a year so it never gets boring. It's a popular wedding photography location because it's so pretty. .......and obviously all the plants and trees. (Captain Cooks Cottage is not free by the way but you can get a good view from the outside). ......If you're not from Australia and haven't heard of possums, they're about the size of a cat with grey fur, a black bushy tail and look quite cute! They're a protected species in Australia but a lot of people complain about them! You can also go on a free guided walk in the park. The tour company has apparently changed since I went on it and it's now run by Serco the gardeners on Saturdays at 10am instead of Wednesdays when I went but Carolien emailed me about it and said "Excellent guide. Most enjoyable". The meeting spot for this is now at the flag located outside the Visitor Centre, across from Cooks' Cottage which is in the south of the garden, off Wellington Parade (tram stop 10). No advance booking is required. 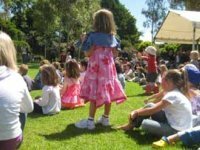 If you're lucky you'll also come across free shows for children in the park in the summer. We found one last year about fairies - rather large adult size ones - a little bit larger than those carved on the fairy tree! It was a really lovely show for the kids. 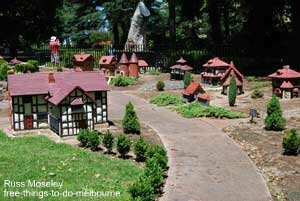 Visit Fitzroy Gardens and click on Summer Events to see if anything is planned when you intend to make your visit. 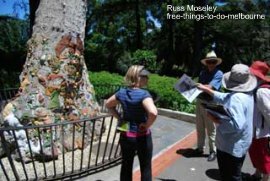 You'll find Fitzroy Gardens located alongside Treasury Gardens so it's only a short walk from Parliament railway station.